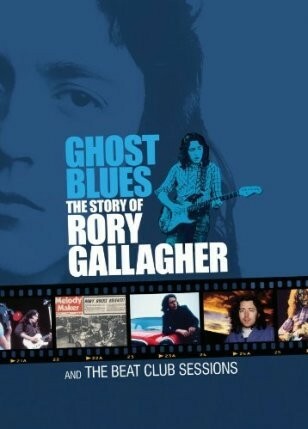 'Ghost Blues' is a fabulous double disc DVD package, which is sure to please fans of the late Irish genius. Disc One features a fascinating, and informative documentary of Rory’s life. It offers in depth coverage of his early life, through his time with Taste, and then a fairly detailed look through his splendid solo career. I’ve always liked Rory’s work, but underestimated just how talented and respected the man was (despite a friend of mine banging on about him for years!). I was soon educated after watching this DVD! The documentary features archive interviews with Rory, plus live footage. Comments and testimonials come from the likes of Bob Geldof, The Edge, Slash, Cameron Crowe, Johnny Marr, Bill Wyman and James Dean Bradfield among others. Rory’s brother, Donal, also contributes, as do some of Rory’s former bandmates like Ted McKenna and Gerry McAvoy, so you can be sure this is as close to finding an accurate portrait of the man as you are going to get. I was particularly interested in hearing about his time with The Rolling Stones, and about his latter years, when he was battling health problems, yet still working. Respect also must be shown to the man for never giving in to record company demands and trying to write 'hit songs'. It was all about the music for Rory Gallagher. Each of the stars commenting come across as truly sincere, which is a testament to what sort of man he was. Disc Two features 'The Beat Club Sessions'. This is probably the selling point to most fans as it features over an hour and a half of unreleased live performances, culled from the German TV series. Rocking favourites like 'Laundromat', 'Crest Of A Wave' and 'Messin’ With The Kid' are all present, plus the likes of 'Pistol Slapper Blues', 'I Could’ve Had Religion', the excellent 'Just The Smile', plus many more. Awesome stuff! Fans of Rory, buy it now. Casual fans, buy it now. Do it!